My very favorite BB cream in the world is the Missha Perfect Cover BB Cream. It feels like nothing on the skin, but delivers seriously impressive coverage that tends to be enough for me most days. 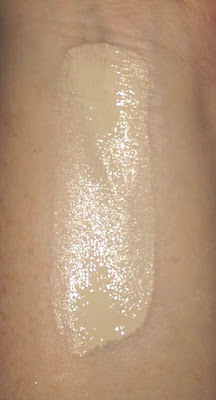 It also has a healthy, dewy finish that's really pretty and the shade No. 13 is nearly a perfect match for my super fair skin. But Missha has a ton of BB cream options, and I wouldn't be the makeup junkie that I am if I weren't a little bit curious about their other formulas. 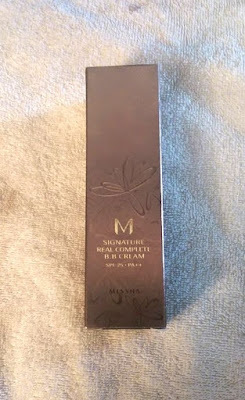 So when they had a sale recently, I decided to give the Missha Signature Real Complete BB Cream a try. Missha's website describes the Signature Real Complete BB Cream as being ideal for sensitive or troubled skin. It also contains gingko water, a botantical complex of 50 natural extracts, and a specialized peptide complex, which supposedly provides serious moisture to the skin so it stays nourished. 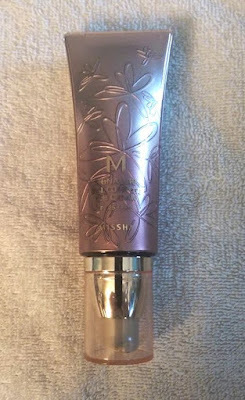 It comes in a similar container to the Missha Perfect Cover BB Cream -- it's a tube with a pump dispenser. It is slightly smaller than the Perfect Cover tube, though; it contains 45 grams of product as compared to 50 grams for the Perfect Cover. The Signature Real Complete BB Cream definitely has a different texture as well. It's thinner and even more liquid-y, so it does feel a little lighter on the skin. The coverage is a bit lighter too, so you might need to pair it with a concealer if you have more serious discoloration. In terms of finish, it's similar to the Perfect Cover, though it's not quite as dewy-looking so it might be a better option for warm weather or oily skin. I purchased the Signature Real Complete in the lightest shade, No. 13 Light Milk Beige, which is very close to the lightest shade, No. 13 Milky Beige, in the Perfect Cover. The former might be a touch lighter, though. All in all, I really like this BB cream. While I still prefer the Perfect Cover, I have been wearing the Signature Real Complete BB Cream a lot lately because I do like it a little bit better for the summer. If you've tried American "BB creams" and have been disappointed because they're nothing more than tinted moisturizers, I definitely recommend trying the Missha products. They really look and feel light on the skin, like a tinted moisturizer, but they provide serious coverage so they can definitely be worn on their own as a foundation. You can purchase the Missha Signature Real Complete BB Cream from the Missha website for $29. Have you tried the Missha Signature Real Complete BB Cream? What's your favorite BB cream?